The play tells the heart-warming story of May, a widowed Grandmother who is preparing to pack up her possessions and head off for a life in sunny Spain. As the removal van is loaded, a sea of memories from the past 45 years comes flooding back and we embark on a journey filled with love, laughter, sadness and sorrow. At its core it is a compelling reflection of what life is like for Northern working-class people, but seamlessly weaves in a social and political commentary that encompasses Thatcherism, the miners’ strike and life in Blair’s Britain and gives the piece a relevance preventing it from being overly sentimental. Indeed this is kitchen-sink drama at its best. The script is brilliant; every bit as funny as Last Of The Summer Wine, as gritty as Coronation Street in the sixties and as poignant as Blood Brothers. It is evident that Godber is an expert people-watcher who understands the human psyche perfectly. 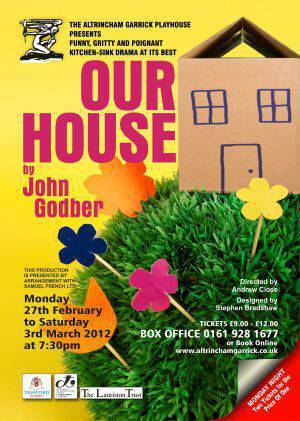 The Altrincham Garrick presents a tale of changing times in their production of John Godber's ?Our House? which wasn?t far from what you?d expect on a night at the Royal Exchange! Whilst May (Janet Slade) a mother, grandmother and recent widow is forced to look forward without her husband, the play focuses on looking back at the times spent in a home she once loved. As you?d expect from a Godber play, the script is irregular as we jump back and forth in time through significant points in May?s memories skilfully keeping the audience up to speed with symbolic lighting design. Janet Slade holds the piece together with ease, her performance was heartfelt and you couldn?t help but love her. The relationship between May and Ted (Graham Simmonds) displayed all the right ingredients as the two complimented each other to great success. Jack, an ex-teacher come comedy writer attempting to break into the American market - can any writer resist putting themselves in plays??? Putting Godber?s self-indulgence aside, Sean Duvall gave a confident and natural performance as the troubled son. Benjamin Latham doubled up as the friendly and slightly simple removal man and the hot head neighbour from hell demonstrating expert acting ability as both. A first time appearance at the Garrick for Benjamin, I hope to see him cast in future productions. Lise Nivern Banks, Ros Greenwood and Ian Fensome equally gave enjoyable performances as neighbours who wouldn?t be out of place down Coronation Street. Two of the kitchen-sink character stereotypes which were particular favourite performances for me were the goby neighbour yelling after her git of a son contrasting with the insecure daughter-in-law. All under the direction of Andrew Close who has given the play a nice pace and using the superb facilities at the Garrick was able to support the show with a nice but simple set, well sought authentic props and accurate costume all together doing him credit and creating the perfect ambiance for the piece. A very enjoyable production, thank you for your hospitality and I look forward to ?The Glee Club?.